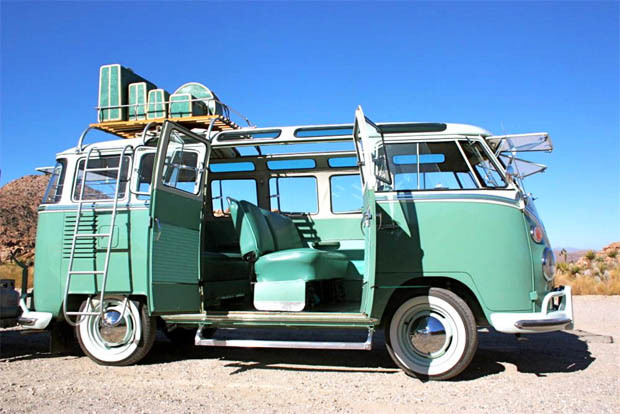 Ask any pop culture fan what a hippie’s choice of wheels is and nine out of ten would probably answer the VW Microbus. Year of construction 1963. VW Samba 23 window bus with color combination green and white, the bus been meticulously maintained, with its four-cylinder engine and four-speed manual transmission. Samba Bus, a van with skylight windows and cloth sunroof, first generation only, also known as a Deluxe Microbus. The term Samba in VW circles refers to a specific model of the Type 2 bus which was manufactured with the highest trim level available. A Samba is a Standard microbus with additions that include trim strips along the beltline and a dash clock. They were marketed for touring the Alps, as they had small skylight windows embedded into the vehicle roof to add viewing windows. Samba buses began production in 1951 and were all fitted with a large Golde sunroof as standard.